Ten years ago, very few people knew what a preserving pan was. Pickling and the making of jams and chutneys were activities associated with elderly ladies, crafts that were on the verge of extinction. Perhaps it was the financial downturn and the search for traditional comforts, the rediscovery of childhood experiences and the aspirationally wholesome world created by magazines like Country Living, but whatever the inspiration, there has been a renaissance of interest in this kind of thing. Diana Henry’s landmark Salt Sugar Smoke came out a few years ago and wowed those of us on the wilder fringes of cooking (and enthralled a lot of other people too with its scholarly and meticulously researched account of techniques, both familiar and exotic). But Thane Prince in this handsome volume aims, I think, at the moderately confident home cook who wants to tackle jam, pickles and preserves with the assistance of clear instructions and attractive, uncluttered graphics. 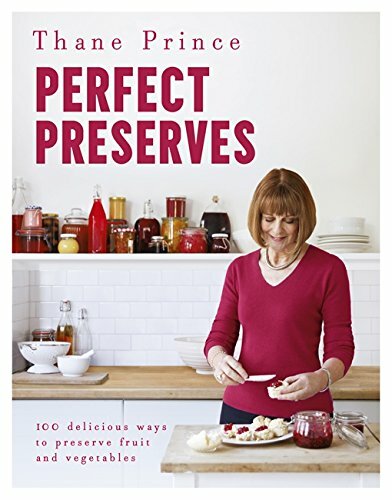 I like the way the book takes us through classic raspberry jam and old-fashioned orange marmalade into the realms of fig and onion jam, fruit butters and cheeses (oh how I love the versatility of damson cheese) and the likes of blackberry ketchup. There is even thought given to cordials and homemade liqueurs. Orange and ginger marmalade is now definitely on my to-do list and I am glad to know the difference between a conserve and a jam (I shall leave you in suspense). I can confirm that Thane’s tomato ketchup is first rate and would add that if you have ever wanted to make your own teriyaki sauce or even hoisin, this is the book for you. Every page speaks with confidence of years of experience and a strong sense that even a novice will make a good fist of things if given this kind of guidance.